Bellwether's diverse team of portfolio managers and family wealth advisors ensure families with big dreams can achieve their financial and life goals without losing sleep. We offer tailored portfolio management and holistic financial planning services all in one place—an approach that inspires confidence and minimizes the organizational burden on busy families. To achieve a dream you need a plan. To achieve a plan you need a process. Families that want to accomplish their financial goals and secure their family's future trust Bellwether to be the financial planning and investment experts so they don't have to be. Need to finance your children's education? Want to buy an investment property? Dream of purchasing a cabin in the woods? We'll help you get there. Tax planning advice, proper insurance, estate planning help, business advisory services and investment management—understanding the full money picture can be a puzzle. We'll put all the pieces together for you. We meet as many times as necessary to review your goals and determine how we can help you get there. We review your existing investments and, if you like, your insurance, tax, estate, charitable giving and business approaches to see how they line up with your goals. We present custom solutions for your situation, including a plan to monitor progress and report back to you. We do the work to achieve your outcomes. This may mean coaching you on personal financial behaviour changes. We track progress as planned, reporting on performance and making adjustments in consultation with you. Are you on the right track? We'll tell you—for free! Are you invested in the right things to reach your goals? Is your risk tolerance actually reflected in your portfolio? Are you paying too much in fees? Bring us your performance report from your bank or broker and we'll offer our advice. Busy families with big dreams need practical, comprehensive help to get to their financial goals. Here's where we can help. Together, we'll create your customized investment policy statement that will determine the right investment management strategy and identify an ideal asset allocation to maximize your returns with less risk and lower fees. If you're a business owner, we'll help you identify ways to manage your business for personal financial benefit. We'll help you with how, what, when and where to give to maximize the impact of your philanthropy for you and the causes you support. Want to ensure you're adequately insured to protect your loved ones? Smoothly transition your wealth from one generation to the next? We'll help you do both. Sometimes it's not what you make but what you keep that matters. We help you with tax planning so you keep more. When you work with Bellwether, you get everything in one place: tailored portfolio management and financial planning expertise. Of course, if you've got your own trusted legal or accounting advisors, we're happy to work with them, too. Don't need the extra planning help? 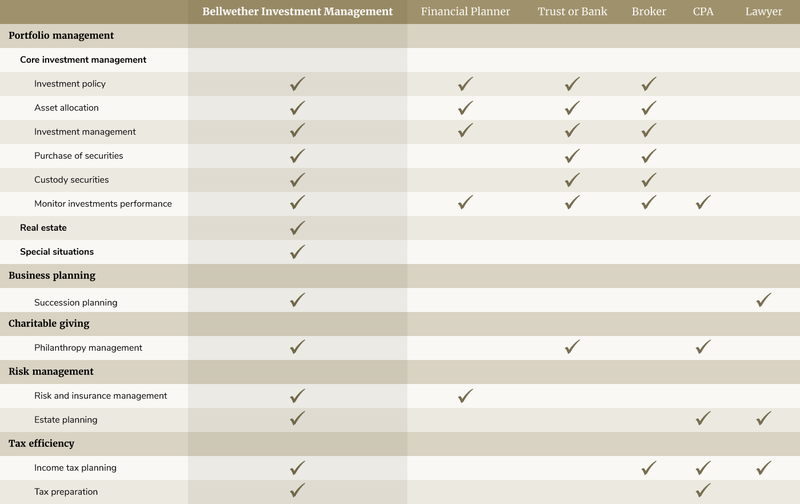 Not every Bellwether client needs comprehensive financial advisory services. If you're looking for investment management on its own, you can work with a Bellwether portfolio manager or family wealth advisor to develop the strategy and get the results you need—no holistic financial plan required.